Pulsefire Ezreal has become one of the most anticipated additions to League of Legends. With all the hype surrounding this sci-fi rendition of our infamous Prodigal Explorer, it might surprise you to learn that he very nearly ended up on the cutting room floor. So how did this hi-tech take on Ezreal go from being nearly abandoned all the way to becoming one of our most ambitious new projects to date? I caught up with Art Team members and Pulsefire Ezreal visionaries Senior Concept Artist Mike (IronStylus), Visual Effects Artist Adam and Senior Character Artist Josh (GrumpyMonkey) to get the inside scoop on their latest achievement. Riot: Tell us a little about the origins of Pulsefire Ezreal. What was the original concept, and how did it wind up becoming one of the most ambitious projects that the Art Team has tackled yet? Adam: He came out of a brainstorm session where we were just tossing around concepts, and someone came up with the idea to give him a robotic kind of gun-arm. It had gotten all the way through QA, and we were about to release it when someone in QA said that it was weird that we were calling this a “cyber” or “pulsefire” Ezreal, when there really wasn’t anything “cyber” or “pulsefire” about it. We actually tried to jam in one spell effect… a little bit extra. GrumpyMonkey: When I jumped in, they were at the “quick pass” moment when Maokai, a Character Artist here, concepted out this sort of futuristic Pulsefire Ezreal, and that was the image that was discovered by the fans. That was what everybody fell in love with, and everyone was like, “Oh, Pulsefire Ezreal, he’s got his leather vest and he’s got a cannon on his arm and he’s running around.” But we weren’t in love with the backpack. It just kind of looked like a vacuum cleaner canister type of thing. I was just barely new to Riot Games at that time, and they said, “Do you want to try reconcepting some of the things on [Pulsefire Ezreal] to make it look better?” [Concept Artist] Larry and I were kicking around a lot of ideas, because we thought we should make it really sleek; really form-fitting. But the concepts that we were making weren’t coming out right. We were starting to getting frustrated when Sho, one of our Animators, walked by wearing this brand new, hard plastic motorcycle backpack. We looked at each other at the same time, and realized that was it! So we had him modeling that for us, and that’s where we got the basic idea. I had this idea that maybe it opens up and it reveals all these inner workings where you could see the “pulse” up his spine. So that when he did his ult the backpack would open up and then you would see all this stuff going on. And then the way that the gun was modeled, it could actually come apart. So we animated the gun as well so that when you ult, the gun starts separating and spinning and opening up. I think that when people saw that in the work in progress, it just sort of snowballed. They said, “If we can do that, why can’t we do even more?” And then we started to think about if we could give him more armor as he leveled up. And then IronStylus kind of took it to the next level. Riot: Did the community’s reaction fuel your desire to turn this one up to 11? GrumpyMonkey: Yeah, I think that was a lot of the motivation. Because when it got out there, everyone just went crazy for it, and we felt that what they had discovered was something incomplete. And so we wanted to make this something that would blow everyone’s mind. IronStylus: We sat down and we said, “What would constitute taking this up to the next level?” We talked about heavy spell effect changes. Eventually, we decided on a few things. One of the big ones was the evolving model, which is kind of where I jumped in. And so I concepted on top of the model of the first Pulsefire Ezreal with the updated backpack, and I explored different methods of upgrading him from Level 6 to 11 to 16. Every time he levels up his ult, he changes, so that you get a much more powerful, impactful experience as you go on. 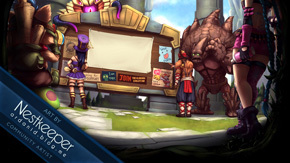 Riot: Let’s talk a little bit more about the different aspects of the evolving model. How does that affect the different aspects of the character, like his animations? IronStylus: The evolving Pulsefire Armor also plays into all the other things that we thought really satisfied players – the spell effects, the animations, the model. Those were the three key points where we established that we wanted improvements to show up as he leveled. Animations, they evolve as well. Like with his backpack; at first he’s just running around, but later on he can fly. Riot: This was our first attempt at a true sci-fi skin. Can you tell us about the challenges that that presented? IronStylus: We also saw the opportunity to use Pulsefire as a test bed for sci-fi. He shoots a laser beam out of his arm, and we don’t have a lot of straight up sci-fi in the game. So there was a lot of hesitance. We wanted Pulsefire Ezreal to be the thing to break through that wall, but we had to proof-of-concept that. Riot: Earlier in the week, you guys were talking about how Pulsefire Ezreal got his hologram dance. Do you want to share that story with everyone? Adam: Initially, we didn’t think we’d have enough time to make him a new dance. So we had to think of something creative that was still awesome for the dance. Since his original dance was so iconic – people either love it or detest it or love it because other people detest it – we decided that it would be cool to have him project a hologram of himself dancing. Unfortunately, I didn’t put the stop information into the script, and so it would just play nonstop when we tested it. Every time you danced, you’d get another copy of Ezreal dancing. 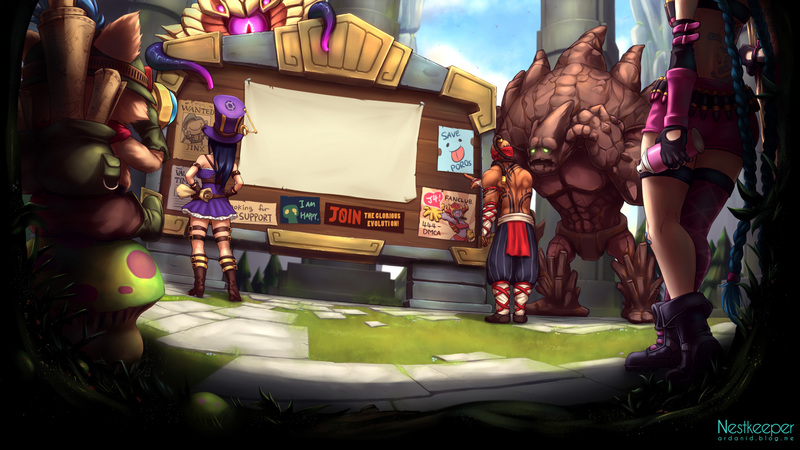 You could have a whole Summoner’s Rift full of Ezreals dancing. Riot: How did the process of making Pulsefire Ezreal compare to the process of making a Legendary Skin? How did your goals evolve as the project kept becoming more ambitious? IronStylus: When we put this together we approached it differently. Basically we looked at what we felt was most rewarding for players and tried to enhance every aspect of that. It’s really satisfying when you kill a minion or champion, for example, so we added a custom effect there. It’s very satisfying to have new animations. It’s very satisfying when you have new spell effects. We wanted to expand the experience across the board, so that Pulsefire Ezreal felt very impactful every time you did something cool. GrumpyMonkey: A lot of people really came together to make this thing happen. IronStylus: They did. Just from the art side, the Pulsefire Ezreal team was like four times the size, but that doesn’t even count all the unsung heroes who took the time to help us get the concept just right and give us the new tech that we needed to do the evolving armor and custom minion kills. Riot: Do you have any other closing words for everyone reading, or anything else that you’d like to share about the project? IronStylus: Just that there were a lot of challenges that we worked to overcome to make this what it is. There were challenges with the sci-fi barrier, to tear down those assumptions. There were challenges with the technology that we overcame. And we also faced pressure from the community, who was really salivating over this. GrumpyMonkey: “Pulsefire Ezreal where ? !” I don’t ever want to see “Pulsefire where?” again on the forums! IronStylus: I think that it was a challenge because we had something out there that people had a taste for, and they wanted it. So I think that it was important for us to take a moment to speak to the community and explain our process. I hope this dev diary will show that we do feel passionately and want to give the players something special. GrumpyMonkey: I hope that people reading this will realize that we’re also fans of the game, and when we decide to hold something for more iterations it’s because we really want to make it the best we can possibly make it. I think people will be stoked for Pulsefire. It really raises the bar. I hope it will inspire us to make even cooler stuff as time goes on. LOL too good! Congratz, guys! Oh boy! Well worth it! My money... all of it. HOLY **** BEANS you get a new summoner profile when you buy the skin.